Year round by United Express operated by SkyWest to Denver. Summer service is provided by United Airlines to Houston, American Airlines to Dallas. 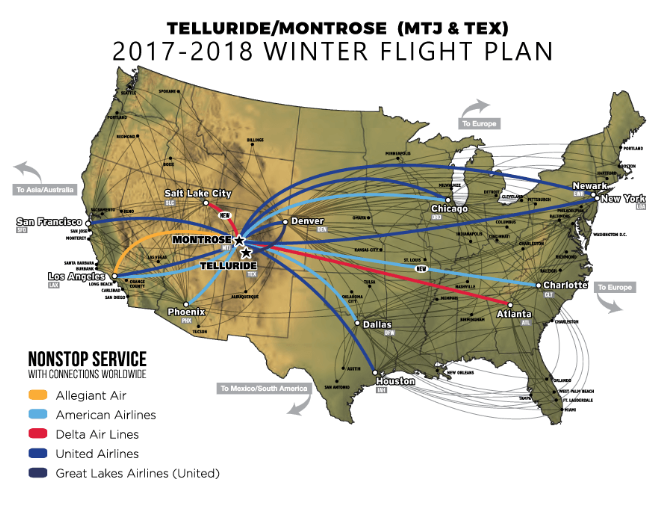 Winter service expands to Houston and Newark operated by United Airlines, service to Dallas and Chicago with American Airlines, service to Atlanta with Delta Airlines, and service to Los Angeles and Phoenix/Mesa with Allegiant Air. Rental cars and ground transportation within the terminal building are Avis, Budget, Hertz, National/Alamo, Mountain Limo, and Telluride Express. The offsite car rental is provided by Enterprise Rental Car. Republic Parking operates public parking at the Montrose Regional Airport. The rates are as follows; daily $7.00, weekly $42.00, monthly $80.00, and annually for $675.00. The monthly and annual rates must be paid in advance. They can be reached at 970-240-8024.